Nothing will make you feel warmer and fuzzier inside than this adorable little girl showing her new prosthetic leg to her friends. The cutie with the brand new pink blade prosthetic is 7-year-old Anu from Birmingham, England. Anu had her right leg amputated shortly after she was born, but thanks to her sporty new addition, she’s beyond ecstatic, and her friends are too. 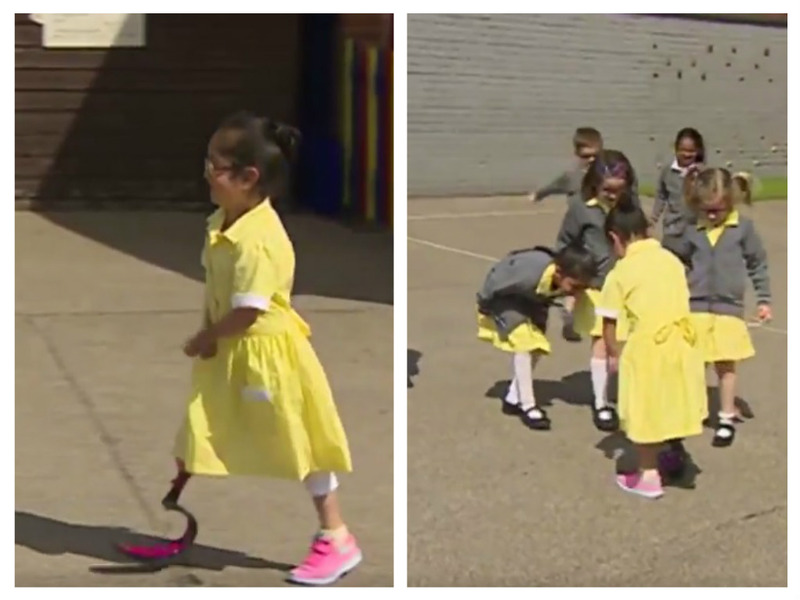 A video clip shared on Twitter by BBC Midlands Today shows Anu debuting her prosthetic leg to her schoolmates. When she walks onto the court, all the kids stop playing and immediately run over to check out her new prosthetic. “Is that your new pink leg?” one friend asks, while another particularly impressed pal says, “Wow!” They gather around her and lean in to get a better look. A couple of her friends even give her huge bear hugs before she makes her way around the court. They are so excited for her, and GAH, our hearts just cannot take all of this unbridled kid joy and affection! Clearly, Anu hangs with the best squad ever. As The Independent reports, Anu’s new blade was custom-made and allows her to run and dance. The sweet 7-year-old is one of hundreds of amputee children to receive a sports prosthetic, thanks to funding that was given to the National Health Service program which is only required to give prosthetics that allow adults and children to walk, not run or swim. We’re incredibly happy for Anu and the adventures her new pink blade will bring her.